"This remarkable project demonstrates that houses do not need large amounts of supplied energy. The principles of good tropical design are employed here with rigour: there is ample cross ventilation, relief from the rising heat, employment of lightweight, heat reflective materials, and shading and sheltering of walls and openings. 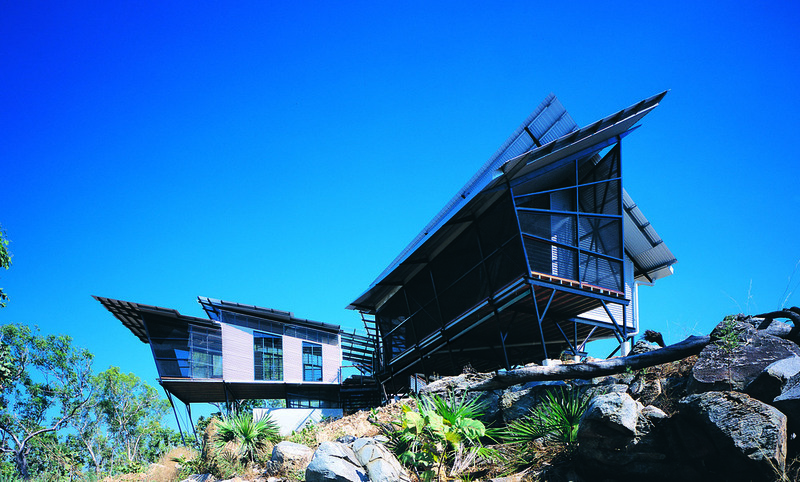 The building is self-sufficient in power and water use and all wastewater is treated on site. Power is collected through solar voltaic cells, stored on site, and converted for use in the house. Hot water is provided through a solar hot water system (nothing is connected to the grid). All cooking is powered by gas, all lightning is compact fluorescent. Water used is rainwater collected from the roof of the house and stored in 120,000 litre tanks. Waste water is treated in a Dowmus-type compost system and excess water is irrigated over the adjacent l this has been beautifully integrated into strong a strong architectural concept."